It has been a beautiful fall up here in Truckee / Tahoe and I was lucky to add many new bright and colorful images to my archive. There are still pockets of yellow and gold out there but the snow is falling as I write this and the aspen and cottonwood leaves will most likely be scarce in a couple of days. 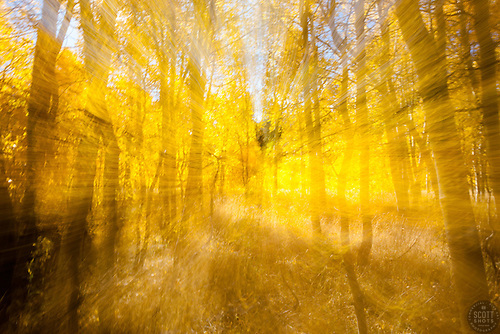 When shooting fall colors, it is easy to want to shoot wide angle photos of the whole aspen grove or cotton wood tree. I do this as well, but don't forget to have some fun with close ups and abstracts. The images below are examples of how I enjoy a getting a little more creative with the color. For the this image, I hand held the camera and used a small aperture and long shutter speed. While the camera was exposing, I intentionally zoomed the lens. I do this several times until I dial in the exposure and speed at which I zoom. It's a fun look that made a great background on my smart phone's display. "Aspen at Fredrick's Meadow 6" - Photograph of yellow aspen trees in the fall at Fredrick's Meadow near Fallen Leaf Lake, California. For this one, I shot the reflection of the aspen trees in a pond. I knew when I shot it that I would be flipping the image upside down when processing, as it is a look I've gone for previously. Sure I could have been more pure and shot the image with the camera upside down but, for me, it's easier to shoot it normally, knowing I'll be flipping it in Photoshop. 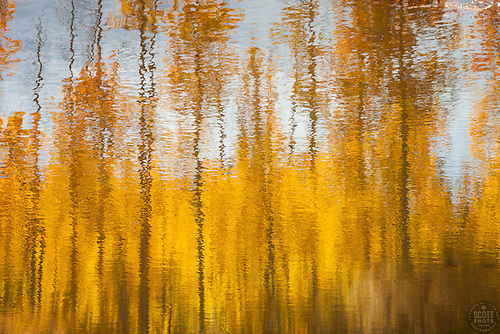 "Aspen Reflections 3" - Photograph of yellow aspen trees reflection in the fall at a pond near Spooner Lake, Nevada. Often when shooting fall colors, I go for back lit yellow leaves. It can create more of a "glowing" look to the leaves. Also, I can often include a sunburst like in the image below to add another interesting element to the shot. If you are close to the trees, a flash can be helpful the bring out even a bit more yellow in the darker leaves that are shaded by other leaves. I used a flash for this one. 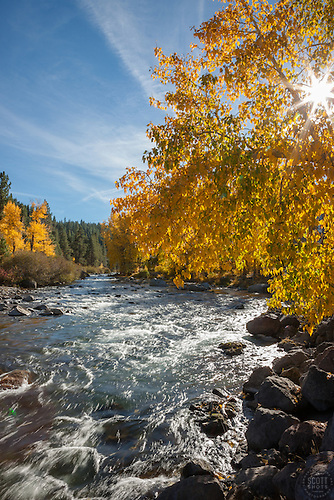 "Truckee River in Autumn 6" - Photograph of the Truckee River in Autumn near Downtown Truckee, California. I find a tripod is not usually necessary when shooting fall colors. This is because the wind is often blowing a bit and you get the "quaking aspen" leaves. The moving leaves can appear blurry at slower shutter speeds so I tend to shoot with a high shutter speed, safe for hand held shots. That being said, I do sometimes use a tripod anyway so I can adjust my settings, dial in my perfect exposure, and make sure I have the same composition. If you were able to get out and shoot some fall colors this year, please leave a link to the images in the comments section below, I'd love to see what you got. Also, if you have any other tips for shooting fall colors, please let us know. Thanks and happy shooting! The images above are available as large fine art prints, photo gift items, and as stock photography. Please click on an image for more info.